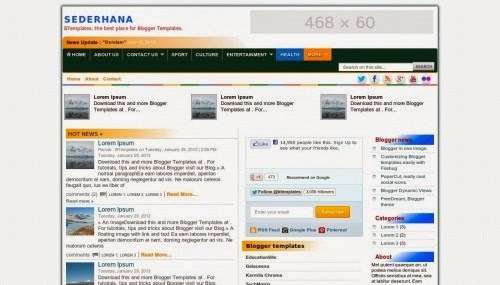 Sederhana Free Premium Blogger Template ini terdiri dari 3 column, magazine-styled, exclusive design for Blogger, ads ready, footer columns, social bookmarking icons, posts thumbnails, drop down menu, breadcrumbs, related posts, pagination, a background pattern, related posts support and well formatted threaded comments. Anda tertarik? Silahkan download disini Gratis..! !